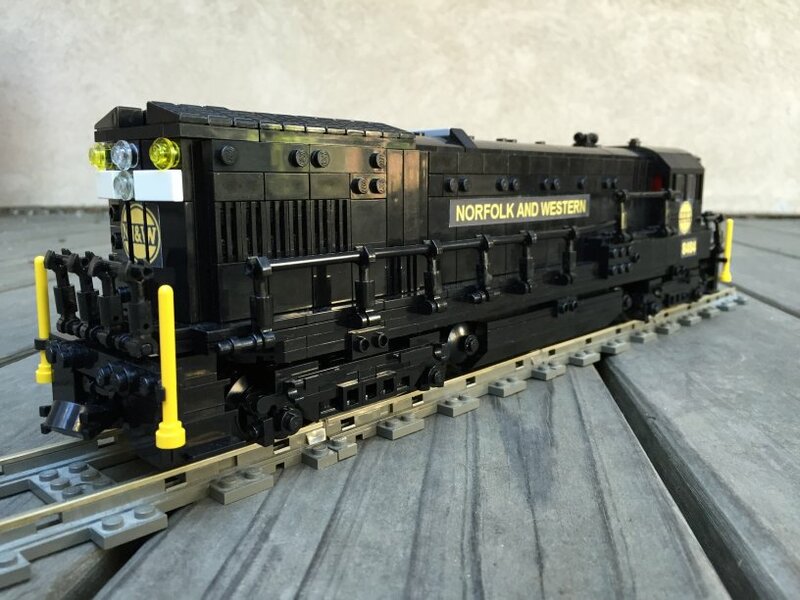 Hey all, I'm finally getting around to sharing one of my latest MOCs, a Norfolk and Western GE U30B. The U30B is a four-axle second-gen diesel-electric locomotive produced between 1966 and 1975. 296 units were built for 12 railroads, of which 110 went to the N&W. 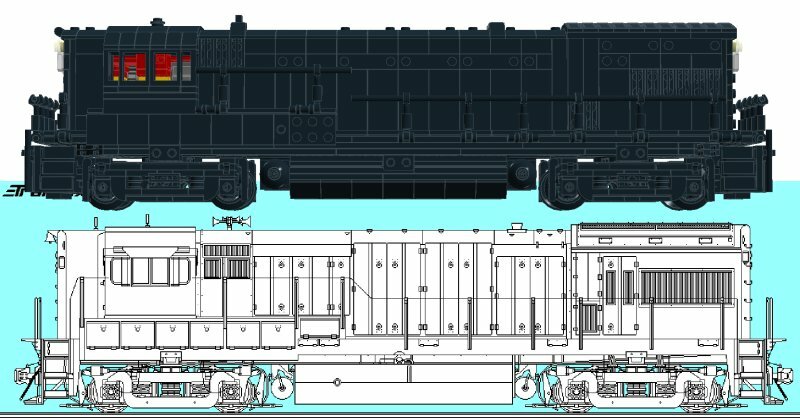 Given these constraints, I chose the N&W U30B because it was one of the last modern diesels to have 1) a high short hood, which I really like, and 2) 4-axle trucks which are more easy to make with more structural integrity than 6-axle trucks. Those being said, U30Bs for other railroads were built with low short hoods, and the 6-axle U30C was twice as popular as the U30B. After a few months of on and off development and construction, this loco was completed in February, just in time for locomotive power testing! At my usual scale of 15" per stud, the 1100 part loco is 8-wide and a whopping 51-long from magnet face to magnet face - the longest I've ever made. The construction isn't really anything to write home about: like my HH1000, most of the model is studs up with large tiled plates forming the detail on the sides. The handrails are made of a third-party tubing, which isn't quite as good as flex, but orders of magnitude cheaper. But the real question is: how does it fair with regard to my original requirements? The PF receiver sits at the end of the loco with the dome exposed - I consider this generally the best case for PF; reception from the front isn't quite as good as it could be, but I'd rather have that than the top of the receiver sticking up further. As with my previous two PF diesels, I have used the big AA battery box in order to get the most amount of energy into the loco without going to a custom power source. This drives two L motors - the biggest motors you can fit in a 5-wide body - connected to a V2 receiver. The battery box is secured by two "crossaxle 3M with knobs". Pulling off the sides (which are connected with about 6 studs) and pulling out these pins allows the box to drop out the bottom. 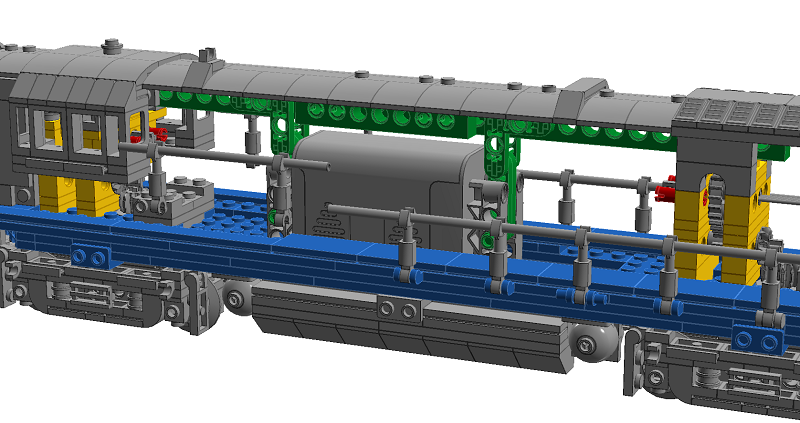 Similar to a Real modern diesel, most of the structural integrity is in the frame (blue), which is just a big mesh of big plates. 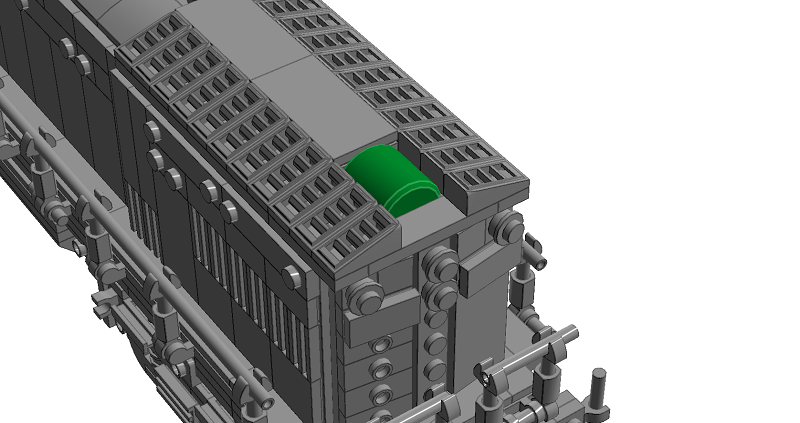 Furthermore, the battery box is mounted to a set of technic beams (green) which rests on the gearboxes (yellow): the weight prevents the gearboxes (which are just studded together) from coming apart when a lot of torque is applied. But those L-motors are pinned into the gearboxes with a pattern (red) such that M motors would also work! And E motors! And I have left enough space and connection such that the old geared motor with the appropriate extra reduction could also be used (I think). Finally, the motors are oriented such that the drivetrain has an extra stage (green) where gears of different sizes can be used and the gear ratio changed. This screencap shows 3:1, but in practice I have been using 5:3 with the 20-tooth and 12-tooth bevels, which I find to be a better balance between speed and torque. ... and if you've gotten here, thanks for looking! Sensational! The speed looks just right and the details are spot on. 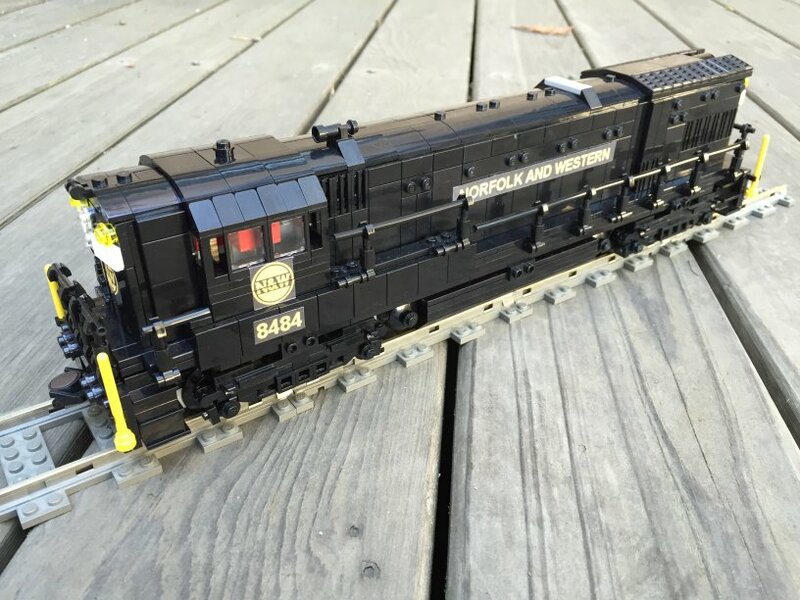 Outstanding work as usual -- this sets the gold standard for LEGO train functionality and appearance. Well done. Nice engineering work. Almost modular in a way. Where do you get your third party flex tubing for hand rails. Someone else told me 14 gauge electrical wire but I've tried it and it is too small for a clip. Very nice work. Fitting all the PF internals in there is no easy task. Wow, that's very impressive and does so much on so many scales. You did a great job capturing the look. Nice trick turning the 1x2x2 train windows sideways. Hiding all of that PF (and not just the small battery box) is impressive unto itself. Then the attention to the structural strength, so many locomotives with this much detailing are very delicate. Great job tackling that two often opposite objectives. Yeah, that was really what I was going for with the internals. When I was making this, I specifically thought about it as being a "flexible" platform: my previous two PF locos had the M motors pointing directly into the trucks and studded to the base with brackets, so it was annoying that I couldn't change them nor change anything in the drive train. It's nylon tubing from McMaster; it's nominally 0.125" OD and 0.093" ID. Made in China, obviously. Nice trick turning the 1x2x2 train windows sideways. 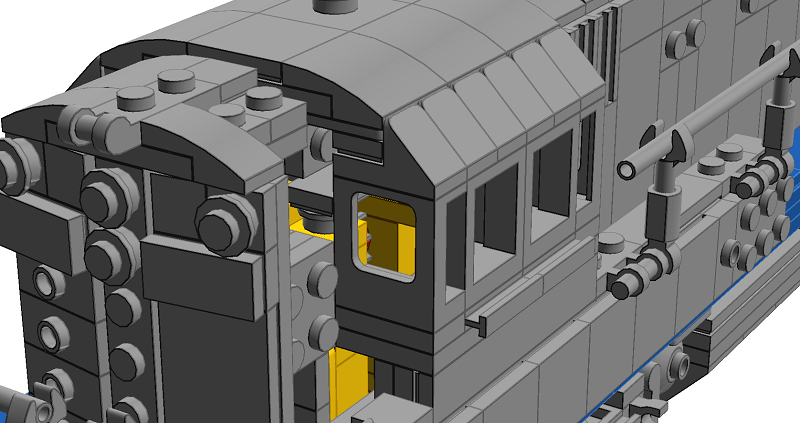 Thanks Zephyr, this was probably one of the parts I was least sure of as far as aesthetics go... not only did it look like that N&W U30Bs had several different layouts of cab windows, but the "easiest" layout still had all the windows being 1.5 studs wide. 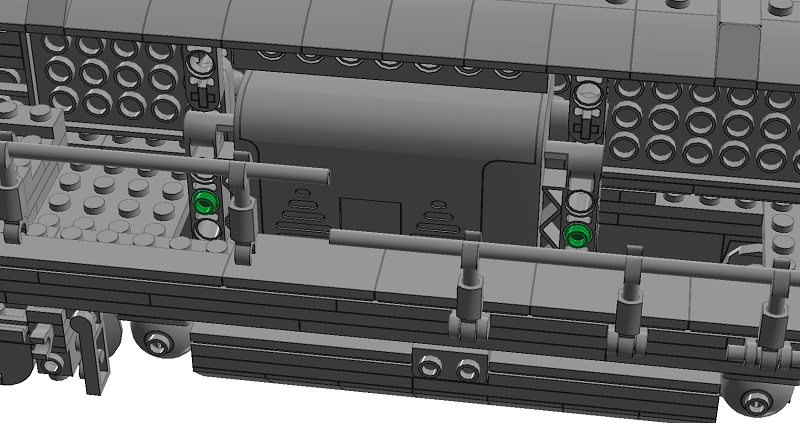 In other layouts the center windows (still 1.5 studs wide) looked like they were extended outward as well! This part, specifically. I'm not sure how well the other colors match Lego; the black tubing is a little glossier and there's some text printed on it. A number of my locomotives use it. Hey Commander Wolf this is another fantastic creation! I love your works and the great attention to details ...this locomotive is full up of awesome building technique and the final result totally rock me! Very nice work. I remember watching these shuffle coal cars through the N&W yard in Kenova, WV when I was little. I like the use of flat plates I am a huge railroad fan myself. You know, it's a pity there aren't more of these left in the US when there's still a ton of GP/SD40s left from around the same era. Just wasn't that popular of a locomotive in the end. Thanks! Modern locos are pretty much just a big steel box, so I'm big on getting the "texture" of the sides right, and so far I've found that the tiles do a really good job. This really wouldn't have been as good before the advent of 2x4 tiles.